Holiday traditions are filled with an abundance of celebrations, gifts, and, of course, food. The festivities start with Thanksgiving, a time for sharing and gratitude. 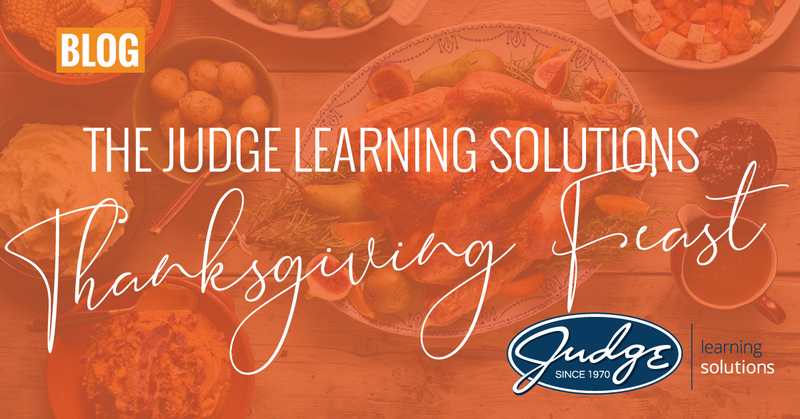 In honor of Thanksgiving, we at Judge Learning Solutions want to share with you our special Thanksgiving feast of gratitude. First and foremost, we are thankful for our clients, each and every one, large and small. Over the past year, we conducted work with 104 unique companies, many of whom trusted us with multiple engagements. We are grateful to have the opportunity to build our relationships and become strategic learning partners for our clients. We appreciate companies that value their workers and recognize that investments in learning drive business results. We are grateful for the opportunity to create strategic alignment for our clients, ensuring learning solutions match business goals. We strive to understand our clients’ business problems before designing solutions by engaging stakeholders early, applying performance consulting skills, and focusing on learners. We work collaboratively with our clients to recommend effective and innovative approaches to close worker skill gaps and meet business goals. We are grateful for those clients who allow us to incorporate evaluation and measurement of ROI into our learning and performance solutions. We know that effective programs are built with evaluation in mind, ensuring performance objectives are tied to real business goals. While designing evaluations takes time, measuring solution effectiveness is key to ensure the program results in measurable, desired business outcomes and ensuring that learning professionals have a seat at the table when organizations make business decisions. We have heard from our clients how grateful they are for our service, including our adaptability, responsiveness, and how hard our teams work to ensure successful solutions. We are thankful for clients who communicate openly with us, especially when something isn’t working well. Not every project or engagement is a perfect experience, but we believe in the growth mindset…there is always room to improve. We are committed to delivering the best possible outcomes to our clients. We are thankful you stick with us and trust us to move forward when we face challenges together. Our clients often express gratitude for the quality of work we produce. We pride ourselves on delivering high-quality solutions that exceed clients’ expectations. We follow a well-structured quality assurance process, checking every deliverable for accuracy and consistency to minimize client review time. Our goal is to deliver a perfect product the first time the client sees it. We are grateful for the professional organizations, partners, and peers who help us stay informed about innovative learning and performance approaches, tools, and technologies, helping us to be life-long learners. We are thankful when clients trust us enough to let us introduce something new into their organizations, and when they collaborate with us to make sure that those innovations are appropriate for their organizational cultures and workers. We are thankful for the talented learning strategists, instructional designers, graphic artists, developers, and voiceover artists who turn solution designs into effective, visually appealing learning and performance assets that engage and thrill our clients. We are continually amazed when what we create together with our clients is more than anyone one of us could have imagined on our own. We hope that you have time for a relaxing Thanksgiving break filled with gratitude. Be grateful for whatever small things make you happy. Please feel free to share what you are thankful for in the comments below.